Last analysis of US Oil expected more downwards movement towards a target at 87.82 to 88.72. Price has moved lower and the target has not been yet met, the structure is incomplete. Now there is more structure of this long downwards wave to analyse I am changing the wave count within it. 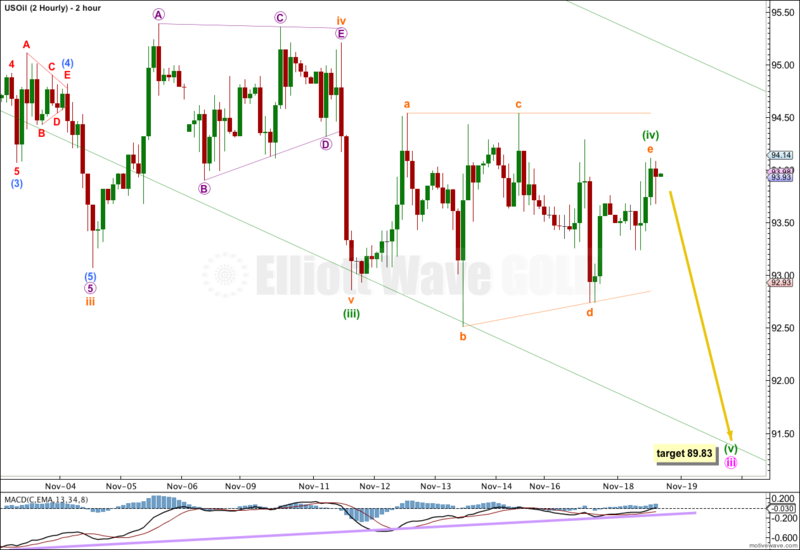 Two fourth wave triangles indicate it is much closer to the end. The target has been recalculated. The labeling within the downwards wave has this week been changed to see the strongest downwards movement as within the third wave. Minute wave iii is extended and not yet complete. Within minute wave iii the middle of the third wave is extended (this is the most common extension). Within minute wave iii there is no Fibonacci ratio between minuette waves (i) and (iii). This makes it more likely we shall see a Fibonacci ratio between minuette wave (v) and minuette waves (i) or (iii). At 89.83 minuette wave (v) would reach equality with minuette wave (i), and this is the most common ratio so it has the highest probability. When minute wave iii is completed then I would expect about four days of upwards movement for minute wave iv to end between 92.51 and 94.54 (within the price range of the fourth wave of one lesser degree). Thereafter, I would expect one relatively short fifth wave down to last about three or four days, and be about 6.70 in length. That would complete the entire structure for minor wave 1. The two triangle structures indicate that two fourth waves have just completed. This indicates further downwards movement for a fifth wave. There is classic technical divergence at the end of subminuette wave iii and minuette wave (iii). For both triangles MACD hovers about the zero line. Overall I expect about two more weeks of downwards movement to end minor wave 1, with a final fourth wave correction during this time. 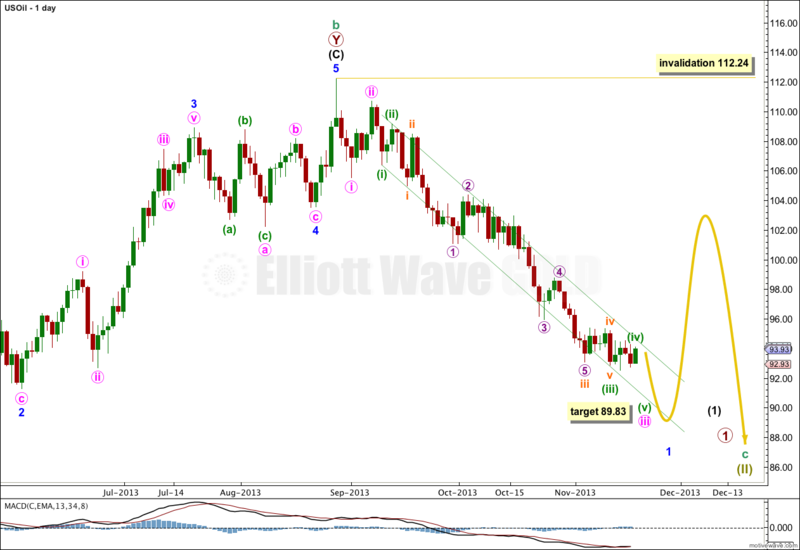 Do you think today’s movement changes the count or target for US oil? I’ll be updating my US Oil analysis in a couple of days.